Adam Ekberg’s The Life of Small Things presents a series of photographs of small events, in which ordinary objects are animated by forces that we may think of as elemental or essential: fire, water, air, light, temperature, gravity. The objects - a disco ball, balloons, jugs of milk, #2 pencils, cocktail umbrellas - are the overlooked stuff of contemporary life, sometimes themselves suggestive of delight, sometimes not. Physics is confirmed; if a pineapple were to eclipse the sun, this is what it would look like. If two flashlights were to shine on one another in an empty room, this is what they would look like, photographed. There are many things that you can do to a lawn chair, some of which will destroy the chair. Today, using graphics software, nearly anything that can be conceived of can be visually realized, but in The Life of Small Things, Ekberg offers a body of fantastic pictures made in camera, on film. The photographs originate as events in the mind, but they are also records of events in the world. Ekberg’s photographs are coy. They appear to be documentations of experiments, where an object is acted on in order to observe the result, but the images are also performances. The juxtapositions are surprising and humorous, and display an instinct for the way in which wonder can spring from an unexpected application of rational principles. Ekberg’s visual reports feel both unlikely and entirely correct. Brought together as a book, Ekberg’s photographs become something else entirely. Beyond each photograph’s role as a documentary testament, it’s also descriptive of a certain world that feels consistent across the pictures. A world of farms and city apartments, forests and lakes, nearly completely devoid of human presence, forms a very specific kind of a backdrop for these fantastic occurrences. It’s a context absent of digital technology, of automobiles or airplanes; no technology at hand in Ekberg’s constructions is less than 70 years old. 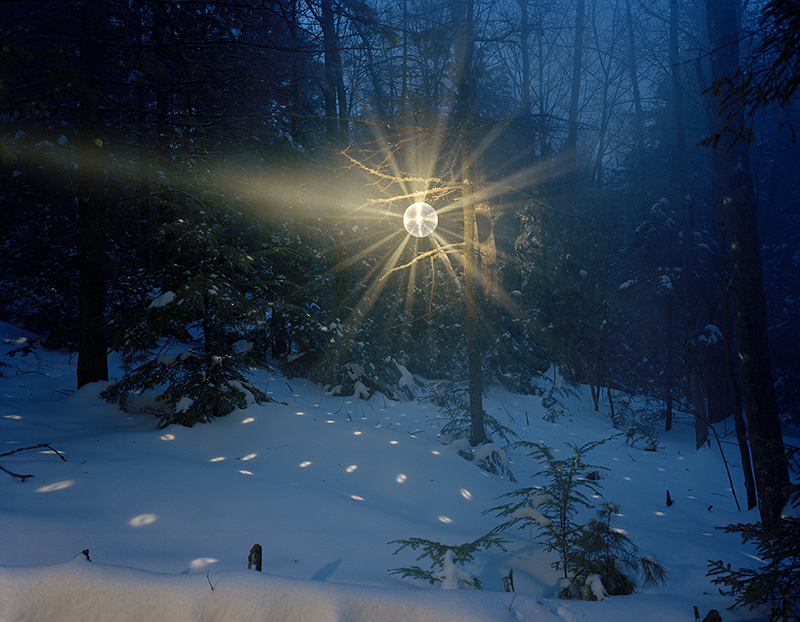 The photograph of a disco ball in the forest is not of just any disco ball; it’s of a particular disco ball, just as the ball is in a particular forest at a particular time of day. There’s a nostalgia for material and an affection for sensations of light, cold and heat. The sameness of mass-produced objects has been refuted by the act of photography. Is this Ekberg’s message, that the pre-digital era allowed us to appreciate small wonders, to see and hear what the embodied world might permit? The book invites us to identify with the objects in a way that individual images do not. Disco balls and drink umbrellas seem to have been imbued with spirit or anima. This anima may not be obvious in every picture, but when we see objects, motifs, locations repeated, they become familiar. One image of an object provokes curiosity, but several images produces acquaintance. The balloons in one picture seen floating over the trees may be related to these other balloons seen in another image tethered to each other and neither falling nor rising; by the time we see a lonely balloon floating despondently in an empty apartment, its string curled on the floor, the balloons have become characters. Along with the physical spectacles that Ekberg imposes on them, he also gives them the suggestion of self-consciousness. This holds true as well for the quixotic vacuum cleaner set to hoover up all of the snow in the forest (even though we see it only once), the irrepressible flashlights, and the doomed lawn furniture. Ultimately the book suggests epistemological questions. What is the relationship between performance and description? What is the relationship between the way we perceive an event, and the way that we perceive or understand the world in which that event is described as having taken place? Looking at Ekberg’s list of photographs in the back of the book – the images span eleven years - we can see how his attention shifted over the years, as he moved from simpler descriptions of seeming contradictions, like unexpected manifestations in the forest, to increasingly elaborate constructions. Had the book been laid out in chronological sequence, the flow would have been more about Ekberg’s process. But arranged as it is, we see something that looks like an argument about the many modes across which photographs operate: performance, document, description, invention, narrative, locus of identification. Photographs can be all of these things, and with the book, Ekberg embraces photography’s variable modes. All of these reasons and stories co-exist; Ekberg revels in the pleasure of asking how slippery it can be, both to nail down what we ask of a picture, and what a picture asks of us.